“Rice, Noodles, and Watermelon: English Summer School in China”, from Christian Faith Publishing author Maralie Akers, is an engaging account of a middle-aged American high school teacher who leaped at the opportunity to visit China, the country of her dreams, to train Chinese English teachers in her language—an adventure that inevitably leads to moments of culture shock, schoolroom mishaps, and musings over the cultural differences between the rice belt and the wheat belt, and, of course, a celebration of the Chinese’s favorite summer fruit. “Rice, Noodles, and Watermelon: English Summer School in China” is a compelling academic saga where America and China meet in the classroom. “Rice, Noodles, and Watermelon: English Summer School in China” is the creation of published author Maralie Akers, a retired teacher and active church member from Central Florida with summer missionary experience in China, Western Europe, and the Middle East. Akers shares the inevitable mixed quality of the first day of class: “We began with the opening ceremony. I had noted in Asian culture how important ceremonies were, so everything was done according to ‘the book.’ Several important officials were there—a Communist Party chairman, provincial education officers (there were fifty thousand schools in the province), foreign affairs officers, and the administrators we had met when we arrived. The lecture hall was a bright, airy rectangular room—long from front to back, with chairs made with cane seats and backs. We had over three hundred in attendance, and although there were ceiling fans spaced at intervals around the hall and garage-type rollup side doors that had been opened to the outside, it was still hot. Published by Christian Faith Publishing, Maralie Akers’s new book is an entertaining, astute exploration of the challenges on either side of the language barrier, as well as the bighearted attempts to overcome them. Artfully blending the observations of an educator and a keen tourist, Akers’s book speaks to lovers of travel, culture, and education. View a synopsis of “Rice, Noodles, and Watermelon: English Summer School in China” on YouTube. 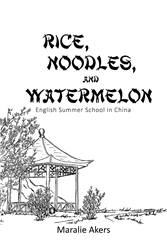 Consumers can purchase “Rice, Noodles, and Watermelon: English Summer School in China” at traditional brick & mortar bookstores, or online at Amazon.com, Apple iTunes store, or Barnes and Noble. For additional information or inquiries about “Rice, Noodles, and Watermelon: English Summer School in China”, contact the Christian Faith Publishing media department at 866-554-0919.